I test fitted the lightsaber for the dome again and I still need to shorten it by 3/8th of an inch to get it to fit all the way inside. 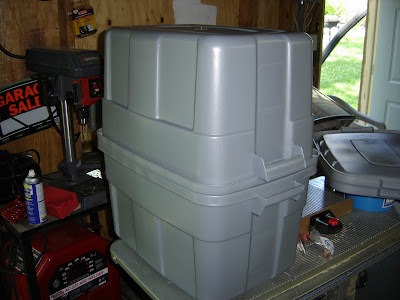 While at Menards today I seen some Rubbermaid containers on sale for $4.50 each and had to get two. Can you tell what for? Monday we will be filming the footage to give to the news station for July 7ths news story about OsFest. Claybo will not be in town for the filming and he was nice enough to let me babysit his droid while he is gone. 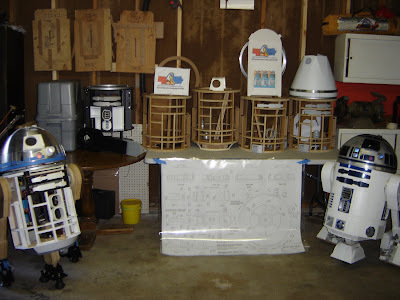 It is cool because it was his droid that I seen years ago that spark my interest in making one for myself. Now I get to drive it around for the news people. What is neat about the picture below is that this is just the droids within 15 miles of my house that will be at OsFest. LOL A lot more from farther away will be coming to the event July 11th threw the 13th. Clay said I could do a repair to his dome electronics if I wanted to so I got the parts today while I was out. His battery connections in his dome need a better connection because they come loose some times. I will show the repair in another post later. I also got some of my resin parts fitted into the panel pieces they go into. I still need to prime my outer feet and the are starting to show signs of rust. If the weather allows I will clean and prime them Tuesday night. 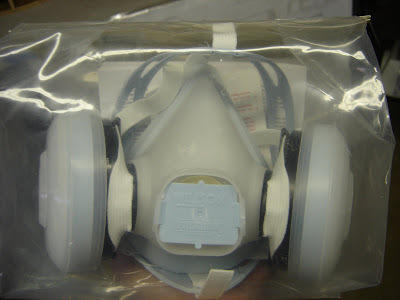 I got a new painting mask while I was at the store as well. Our R2 group will be making a short vid to give to the local news station to help advertise Osfest. My friend Clay let us barrow his R2 while he is out of town and we did a test to make sure the two droids did not interfere with each other. 4th new frame is taken! R2-Central builder Clay has taken the last frame! All our droid babys now have a home! Taking R2 for a drive update. After many successful trys driving R2 around on the smooth level surface of my garage I took R2 out of the garage today to test him on some different surfaces to see how he fared. He did good on concrete but got stuck in every crack he could find. I may try turning his front foot omni balls around so there are two up front instead of one and see if that does anything if I take edges at an angle. Im beginning to see why people like casters better. LOL Every time he got stuck he lurched forward and made me cringe thinking he would fall right on his new dome. Plus every time there was a decline he would not back up or turn. I then took him inside on some semi high pile carpet. He would not move an inch. So I took the 12 volts I was using and added another battery to make it 24 volts. That did the trick and R2 moved around pretty good considering. After about a minute he stopped moving again and the 100 watt motors that I got from Andy were very hot to the touch. Once I let them cool down they moved for a while again. 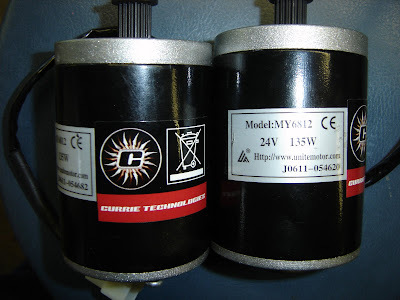 My other motors came in today that are 135 watt instead of 100 watt. Hopefully this will make a difference when I put them in next week. I also have a 4 inch omni ball that I could use instead of the 3 two inch ones in the center foot but I do not have the time to modify the front foot before OsFest. So as long as the carpet at OsFest is not super plush or busted up concrete I will leave well enough alone for now and work on the dome. I did some more cutting and filing on the 300 Dome today. I am leaving all the inner dome cuts except the holoprojecters and dome bumps smaller than normal. That way when the two domes are bonded I can file them to where I want them to be. The reason I am not doing this to the holos and dome bumps is because the outer dome will cover them anyway when put together. I put some blue masking tape around the bottom part of the dome so the two halves do not scratch on one another when taken on and off. Need to file the rear logic a bit more I wish my dark black lens would come before OsFest. R2! Don't look away when I'm trying to take a picture! 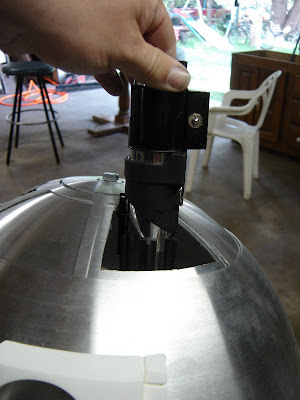 For those of you that have never seen it before elsewhere, this is how to cut a circle in a dome the cheap way. After checking all your trace out lines a few times take a drill with a sharp bit and drill along the inside of your traced area. Next carefully wiggle your drill side to side till it connects a few adjacent holes together in a few areas. 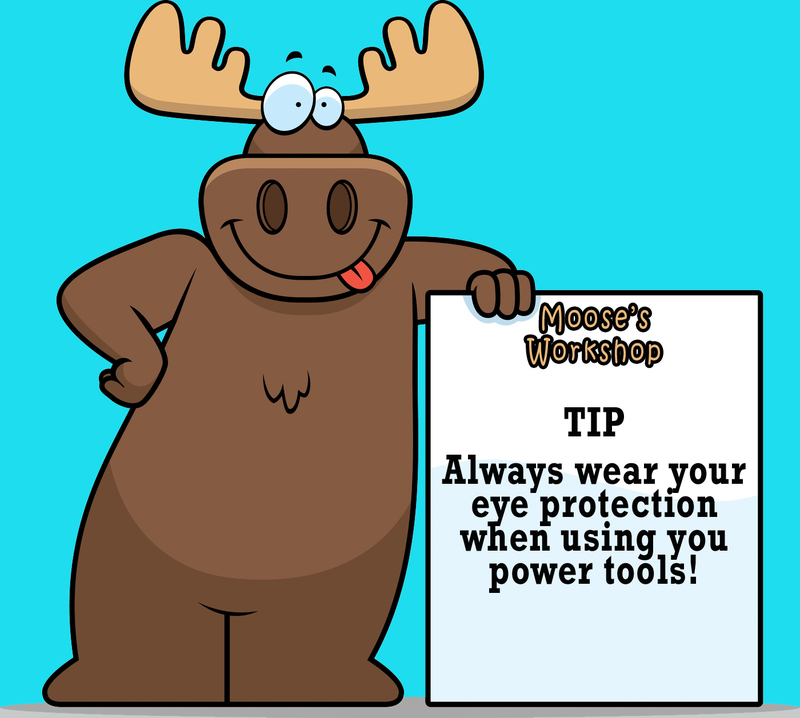 Then take a hacksaw blade and cut alone the dotted lines. Take the curved side of a large rasp and file till you are a hair past you layout lines. Flip the dome over and use a finishing rasp to take off all the burrs. As you can see the holoprojector ring fits perfectly. I am going to skip all the details for now but we finally got R2-CM up and running! Well today the family came over and I thought it was time to get R2 back off the table so I made a simple platform to hold him up as I have not bolted any of the legs in place yet. Here are a few pics of the platform, they go between the wheels to keep the legs from moving. 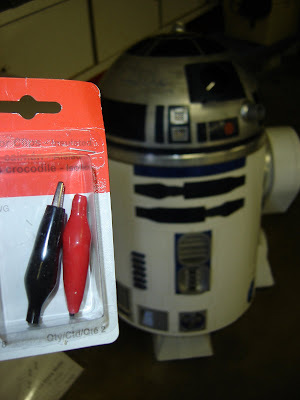 As you can see in the photo above and below I could not help but temporarily hot glue R2's main eye and holoprojector in place so he looked more like R2. After the family festivities were over I started prepping for tomorrows "hopefully" big day. R2's JAG outer feet come tomorrow and I can finally verify his ride height is right on all three feet. That way I can finally drill the mounting holes for the center foot and clamp the outer feet in place. Then "hopefully" R2 can move around on his own for the first time! I first wired up the key coder and got all the wires nice and neat. Then I used Velcro on the receiver and the receiver battery to hold them in place. I installed the receiver battery on/off/charging switch. I also started to straighten up all the other wiring inside him. I also removed the cheap motor controller I got for the dome and purchased a Vantec 411-P. I did not like that reverse was so slow on the one I had. Today I cut a few inches off the center leg to make extra room inside the frame. I then centered the leg in the skirt hole with a couple scrap pieces of 3/4 inch plywood. I will not attach it till Monday when I have someone to help me. Next I started on the scary part of the dome work. I centered the two halves of the domes and traced all the lines to the inner dome. I then double checked to make sure everything was correct. I first used a step bit to drill the holes for the dome bumps. I need to sand them a hair bigger later on. 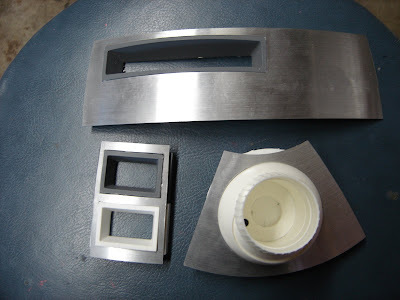 Next I drilled out the large holes for two of the holoprojectors. The mailman then showed up with some parts I needed for another project. An old jukebox that I have been working on. I installed the parts and she worked like new. What does this have to do with R2ing you say? I brought the Jukebox into my work area and installed some old Star Wars 35s and can now listen to old school Star Wars while I work LOL. While listening to some old tunes I then sanded the rough drilled openings for the holoprojectors. Now you can see right threw my dome. Hahaha. With the outer dome installed everything looks great. 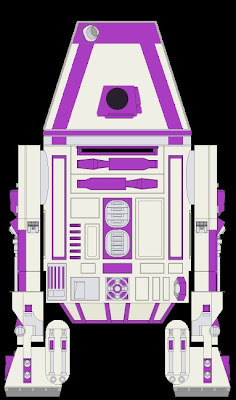 My second droid will be named R4-MM. MM for my name and also multi-media. He is probably going to be the same purple as Mace Windu's lightsaber. Here is a mock up of what he will look like. He will have a projection TV player in his dome and my old PS2 behind the large data port. R2 making sounds and more frames added to collection. No time for a long update so here is a vid of R2 making sounds, his center foot casters on and another frame added to the collection. When I got home from work my Futaba 9 channel remote was waiting for me! My mind went blank and I just went to work installing it. One thing I noticed is that the key coder did not have the nuts on all the switches. Has anyone else ever gotten theirs like this? I took the Vantec motor controller and added all the wires and tied them up neatly. Then I made an L-shaped mounting bracket out of this old 4x4 post holder so I could attach the controller to the frame of my droid. After a while Jayson came over to lend a hand and we hooked up the motor controler to only 12 volts for the first test. Here is a Vid of R2-CM's first movement done via remote. We then hooked up the cheap $19.00 motor controller I got a while back for the dome but it only works in one direction, so now I have to find a better one. After that a storm came rolling in so we packed up for the night. Come to think of it I was so into hooking up the remote that I never ate dinner LOL. Here is my R2's first power up of his feet at full power (24 volts). I still need to line everything up a little better but not bad for a first go of things. One small step for droids, one giant leap for Moose kind. Late last night the delivery man dropped off a package. I was hoping it was my remote but it was my new E-scooter wheels. These wheels are a half inch in diameter smaller then the old ones which let me put them on the lowest setting without rubbing. The wheels came with a break but I will not need them so I took them off. Also if you will notice my new camera phone is in the shot. What a piece of junk! Jason (Dash) was nice enough to lend me his camera for a while so I could keep updating my blog. Thanks Dash! I used the new belts I got that DarthWill suggested and everything is now fitting like a glove! Here is a side by side shot of my old setup and the new one. My ride height is now where I would like it. Also my motor holders are now perfectly level which was another thing that was bugging me. I would like to thank everyone for their suggestions and help on this matter. I know this new setup will not work great on carpet but it is better than not moving at all. All I need now are some backup scooter motors. I would like to get 135 watt 24 volt ones. Any clue where to get a decent pair for low cost?